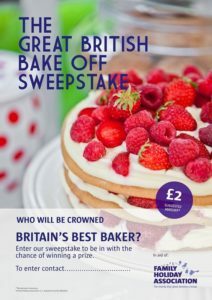 The Great British Bake Off is bake… I mean is back! The hugely popular BBC show returned on Wednesday 24 August. We’ve created a simple Sweepstake template – and there’s still time to get involved! Simply add the names of the contestants and take a donation to enter – we’ve suggested £2 but that’s up to you. As well as ramping up the excitement, the winner can win a prize or percentage of the proceeds.